THE sad news of the death of the iconic DJ and TV presenter Ed ‘Stewpot’ Stewart reached millions of fans across the country – and not least a large contingent in Woking. The legendary broadcaster died on Saturday (9 January) in Bournemouth a few days after having a stroke at the age of 74. Ed was known for his dedication to charities, including the Royal National Institute for the Blind. He lived in Pyrford for a number of years and, in 2008, volunteered his talents for the local Woking Talking Newspaper charity, a free service that records each edition of the News & Mail to help residents who are visually impaired keep in touch with what’s happening in their community. 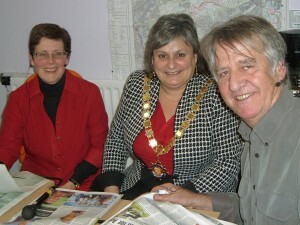 Ed is pictured reading the news with the 2009 Mayor of Woking, Tina Liddington, at the Moorcroft Centre for the Community in Westfield. A keen sportsman, Ed was a lifelong Everton fan but, closer to home, continued to be a regular visitor to Woking Football Club, and the Geoff Chapple Lounge as sponsor Andrew Laithwaite’s guest. The club convey their condolences to Ed’s family and friends. As well as national fame as a BBC radio DJ – most notably for his Radio 1 Saturday morning Junior Choice show, which generated an enormous audience of more than 16 million listeners – he was also a favourite TV presenter for the BBC’s Crackerjack children’s programme, and hosted Top Of The Pops on a regular basis. Born Edward Mainwaring in Devon in 1941, Ed began broadcasting for Radio Hong Kong in 1961, where he was a sports commentator before becoming a DJ. When he returned to England he joined the pirate station Radio London, before becoming one of the first DJs to present on BBC Radio 1 after it was launched in 1967. He married Chiara Henney in 1974 and they divorced in 2005. Ed continued to host editions of Junior Choice on Christmas Day from 2008 up to 2015. He leaves behind a son and a daughter.